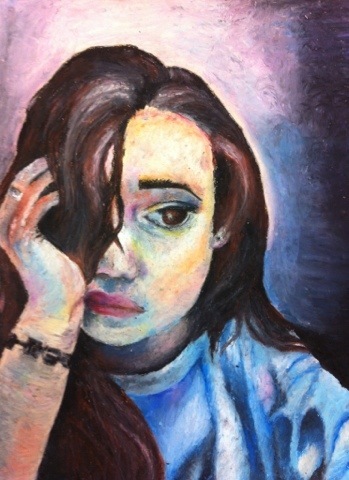 Mia B (S4/OLSP) has been experimenting and practicing for her Standard Grade expressive exam in a few weeks. She’ll be among the last of all Scottish Pupils this year to sit the exam as the qualifications change next year. The pastel drawing above was actually of a different girl, though when we draw portraits we seem to project ourselves into them and now the image looks a lot like Mia, in fact, more so than the original model. One of the last Standard Grade topics is ‘reflections’, so instead of going for the obvious light reflections, Mia has chosen to go with thought reflections and I think that really comes across. I love the use of subtle blues and purples that express an air of worry or concern.